The very best that great design, beautiful wood and impeccable craftsmanship can do is to lift the spirits of all of those who have the pleasure of experiencing such a room. At Andersen Knudsen Design when these critical elements have been skillfully interwoven, true lasting beauty and design have been successfully accomplished. 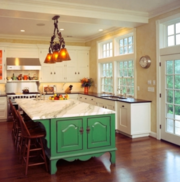 Rate and review Andersen-Knudsen Design LLC in Kirkwood, PA, United States! Share your experiences at Andersen-Knudsen Design LLC with your friends or discover more Carpenters in Kirkwood, PA, United States.